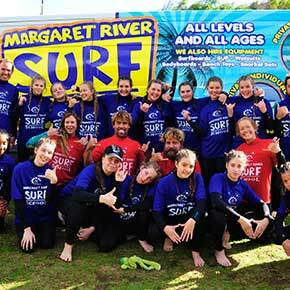 We offer your school or corporate team a safe, fun surfing program in the Margaret River area. The beach is a big part of life in Australia and it is imperative that we can identify and deal with the unpredictable conditions of the ocean that surrounds our beautiful country. Learning to surf is a fantastic confidence builder and brings with it a great sense of achievement, responsibility and life long skills in and out of the water. Surf lessons include a wetsuit and board for each participant for the duration of the lesson. We have a minimum of a 1:8 participant to coach ratio. Participants learn about the waves, rips and hazards, surfing etiquette, as well as techniques on how to carry their board, attach their leg rope, paddle for a wave and stand up safely. We also hold team-building activities on the beach and in the water. Our qualified, fun and friendly coaches assist with wave selection and help participants to balance on their board as they get a feel for paddling and standing up on the waves. If participants are more advanced, surf coaches can improve techniques and offer professional advice to take their surfing to the next level. Beginner lessons: We teach the fundamentals of surfing and beach safety while having loads of fun in the process. Even if participants have surfed before we can work with them to improve their skills at a beginner level. Intermediate – Advanced Lesson: We can cater for schools and corporate teams who are already confident surfers, with their own equipment, looking to take their surfing to the next level. We can teach participants how to improve their skills and add new maneuvers to their repertoire. nudie SurfGroms Program: Our nudie SurfGroms program is designed for primary school aged children (5-12 years). Schools can apply to have the program fully funded through Sporting Schools. Students also receive a pack full of beach gear. Team Building: Our lessons can also include important team building exercises that bring your groups bond closer together and energise them to take on whatever challenge comes their way! Participants work together to achieve vital surf rescues and beach relays. We can include activities both in and out of the water so please feel free to discuss your options with us. We offer discounts if you book more than 8 people or if you are booking multiple sessions. Add surfing to your program today! Read on, or call us on 0401 616 200 to find out more! Our coaches are fully qualified through Surfing Australia’s coaching courses. Their accreditation’s are recognized by the National Sporting Organisation for coaching and the only courses recognized by the Australian Sports Commission’s National Coaching Accreditation Scheme.. Every coach also holds a Working with Children Check and (at minimum) a current Surf Rescue and Senior First Aid Certificate. Our lessons are held at the safest beaches for the conditions on the day. We can be flexible with our location to suit the conditions and abilities of the students with our vast range of beach options. We have a full range of wetsuits and surfboards that are provided to participants for the duration of their lesson. If preferred, students can wear their own wetsuits and intermediate to advanced lessons can cater for students using their own surfboards too. Equipment hire for the lesson is included in the cost of the program. Our mobile van is also kitted with a shower so you will leave the beach fresher than you came! Endorsed by Surfing Australia, the national sporting organisation adhere to strict safety guidelines and precautions to guarantee premium surfing lessons. Do you have a certificate of insurance? Yes we do and we send a copy for your records upon making a booking. Are you registered with Sporting Schools? Yes we are and your school can apply for funding. Primary school aged children can surf for free through our Weet-Bix SurfGroms program, please contact us for more information. We ask schools to finalize full payment 2 weeks prior to their lesson date. A deposit of 50% is required to secure your booking. We will email an invoice for you to pay by credit card, bank transfer or cheque. We require at least 4 weeks notice for any refunds to occur. We send our full terms and conditions upon booking. We do get very busy so the earlier the better to secure your booking on your preferred dates. To check availability please call us or go online. Call us to discuss our discounted school group prices. Teachers can join in for free! The joys of surfing, being in the fresh air and feeling the thrill of riding a wave and the weightlessness of the open ocean have many benefits on your body mind and spirit. Surfing builds student confidence from experiencing success in gaining new skills or further developing existing skills. Students learn important ocean awareness skills vital for safety. Surfing builds peer bonds and support through team building activities. Surfing encourages a healthy lifestyles and improved fitness. Surfing improves cardiovascular fitness as wells as builds shoulder, back, leg and core strength. Surfing improves coordination and balance. Surfing is a great outlet for stress and tension.